For people working on the C++ code. The modmanager is coded in Lua and C++. Using lua makes it more customizable (it wasn't really easier to code). Every subgame should contain a modmanager.lua file that contains the functions to contact the "central server" (modlist server). Therefore the modmanager is "branded" by the selected game! I also wrote a lua script that helps game admins create a modlist. By default the script uses a ftp server, but it should not be too hard to change it to http. 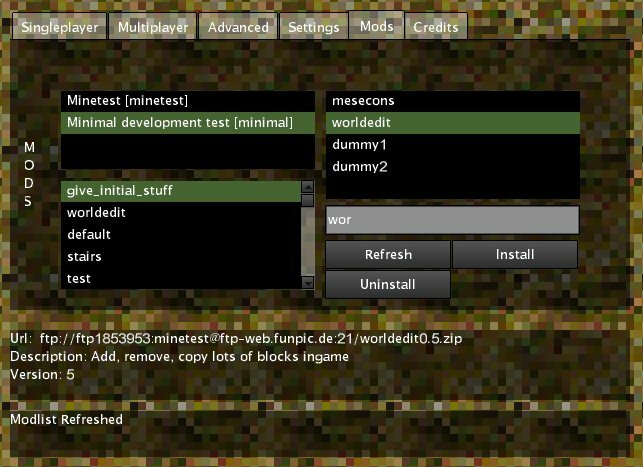 It would be awesome if people create their own games with their own modmanager.lua + central server. I was not planning to make a mod repo server myself. The final goal: No more topics like "HEEEEEEELP PLSSSS!!!!!! CANNOT INSTALL MODSSSS!!!" Just compile it like a normal minetest with the dependencies installed. This is NOT a mod, you need to compile it. Mind this is still in an early phase. Last edited by Jeija on Wed Oct 24, 2012 16:33, edited 1 time in total. Maybe someone else can compile it for you. Should be in the default/official game. Whats about a ingame multiplayer browser for various server-IP's ? I'd like to do all of these things, but I'd also like to make sure that it gets merged later on. Last edited by Jeija on Thu Jul 26, 2012 15:01, edited 1 time in total. Nice work Jeija, downloading now. How about adding an auto-refresh feature for the mods list? or maybe make it optional to have the list auto-refresh with a checkbox maybe? It would be nice to see this merged upstream. Everyone please mind that the windows version does NOT work yet! Auto-refresh would be nice, but refreshing takes like 1 second, and that can be annoying. It already has modlist caching so that it does not have to refresh every time it needs the modlist. I'd like to push this, but it should be 100% working. If someone knows a little using cmake and porting this, please help! I have to add luazip and luasocket so that they compile on windows. Jeija wrote: I'd like to push this, but it should be 100% working. help with a windows build? or just help in general? I will try doing a windows build when I get home from work tonight, I tried it out on my linux desktop yesterday so didn't have any problems, although I tend to use windows as my main OS so I will need to compile it for that anyway. Some help for the windows build would be awesome!!! I've got the servers back up and running, just need to restore there websites from backup and then I should be able to have a look at compiling this for you. Should be in the next couple of hours hopefully. Is the mod server down at the moment? keep getting "Error: invalid server reply" when trying to fetch the mods list. I downloaded, then compiled, then ran (on the surface everything seems to work). Jeija wrote: Everyone please mind that the windows version does NOT work yet! -.- of course it doesn't work yet. Dannydark is working on the problem, trying to add luazip and luasocket to minetest. No errors other than that, I've manually compiled luasocket and luazip to test, I will get them added to cmake and will send a pull request on github when I get home in about an hour. EDIT: I think I know why celeron55 probably won't include this upstream, as it adds quite a few more dependencies, I will keep going ahead adding them in, but was just thinking would it not just be easier to link to the pre-compiled windows binaries needed for this? The reason I say that is because the extra lua libraries and there dependencies are not actually required to build minetest with the mod manager...however, they are obviously needed for it to function. I will see if I can come up with a better way to do this for windows, but at the moment I'm not really sure what the best approach would be for this, although saying that I'm not all that sure the pre-compiled binaries work properly as I now seem to be getting a segfault when trying to refresh the mod list ¬_¬. Will keep you updated. Last edited by dannydark on Sun Jul 29, 2012 19:13, edited 1 time in total. Does it HAVE to be part of minetest? Perhaps a 2nd exe to manage mods wouldn't be such a bad idea. Could also double up as a server finder/connecter. It is not part of minetest (only the GUI, but that has to be part of it). All he rest is in lua. Why do you think there is an advantage when using a second exe? It needs the librarys anyway, the lua script needs them.